This month, Mahantesh Halappanavar assumed the role as new Team Lead of the Analysis and Algorithms group within the Advanced Computing, Mathematics, and Data Division’s Data Sciences pillar. Mahantesh has long been a contributor to the many efforts at Pacific Northwest National Laboratory that use algorithmic techniques to solve scientific computing problems. His interest in graph algorithms applied to high-performance computing (HPC) has resulted in novel research affecting areas spanning graph matching and coloring to combinatorial algorithms to stochastic coordinate descent and community detection. Mahantesh’s work examining architectural features and algorithm design for multithreaded architectures has provided ongoing benefits to the Center for Adaptive Supercomputing Software. 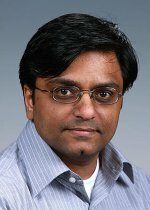 In addition to his work specifically in the HPC area, Mahantesh also is a contributor to several major Laboratory initiatives and projects, including providing graph algorithmic solutions for the power grid via the M2ACS: Multifaceted Mathematics for Complex Energy Systems project. Mahantesh joined PNNL in 2009 after earning his Ph.D. in computer science from Old Dominion University (Virginia). He is a member of the Society of Industrial and Applied Mathematics and the Association for Computing Machinery.